Exxon Mobil Corp.’s deal in January for a swath of Permian Basin drilling real estate came with a sweetener for the sellers. The heirs of oil tycoon Perry Bass will get $1 billion in cash by 2032 — if drilling goes well for Exxon. That payout would be on top of the $5.6 billion in Exxon shares the Bass family is getting for Bopco LP and other New Mexico and West Texas holdings in the Permian, the most productive U.S. oilfield. 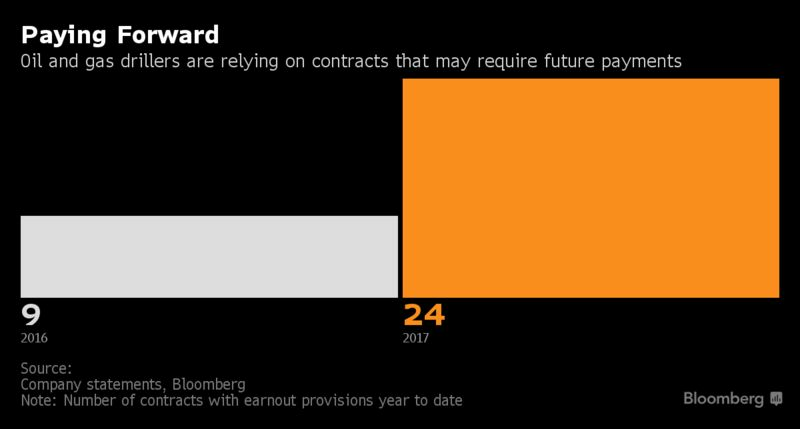 Such payouts — earnouts or contingent payments in M&A jargon — have become much more prevalent in the oil patch this year as deal-hungry explorers, services providers and pipeline operators hedge their bets on the future of shale. Some depend on oil or gas prices rising. Others are tied to future profits or production volumes. Most share the same premise: The seller gets more money if the deal goes well for the buyer. At least 24 oil and gas deals in the U.S. and Canada with a combined value of more than $25 billion have included earnouts so far this year, according to a review of deal announcements. That review turned up only nine such deals, totaling more than $5 billion, over the same period last year. The rise in earnouts coincides with a slump in dealmaking in 2017 after last year’s rebound in oil and natural prices spurred a takeover boom. North American energy mergers totaled about $135 billion through the end of October, a decline of more than 25 percent from a year earlier, according to data compiled by Bloomberg. U.S. shale producers’ rising output contributed to a global oil glut that sent crude prices tumbling this summer before rallying in the fall. That volatility has created uncertainty that earnouts are designed to address. The largest deal with an earnout this year was Cenovus Energy Inc.’s $13.3 billion purchase in May of Canadian oil assets from ConocoPhillips, which will get extra payments over five years if prices for West Canada Select top C$52 ($40.53) a barrel. If oil averages C$60 a barrel, for example, Conoco would get about C$200 million a year, Conoco executives told analysts when announcing the deal in March. West Canada Select was trading at C$55.18 on Monday, according to data compiled by Bloomberg. Conoco’s $2.7 billion sale of its natural gas holdings in New Mexico to Hilcorp Energy Co. also had an earnout. So did many others: Laredo Petroleum Inc.’s $1.8 billion sale of its stake in pipeline operator Medallion Gathering & Processing LLC to Global Infrastructure Partners; Noble Energy Inc.’s $1.1 billion sale of natural gas assets in West Virginia and Pennsylvania to Quantum Energy Partners LLC; and Targa Resources Corp.’s $565 million purchase of most of pipeline operator Outrigger Energy LLC. Earnouts can make sense in deals for companies operating in newly developing basins where there isn’t a lot of historical drilling data, said Ali Akbar, a managing director with Royal Bank of Canada’s RBC Capital Markets who specializes in energy pipeline deals. RBC advised Targa on its purchase of Outrigger, which controls a network of oil and gas gathering pipelines in a fast-growing portion of the Permian known as the Delaware Basin. The deal calls for Targa pay as much as $935 million more in 2018 and 2019 to Outrigger’s former owner, Denham Capital Management, depending on how much it makes on contracts with the customers Outrigger had when the deal closed in March. New customers don’t count. The earnout “de-risked” the transaction, Targa Chief Financial Officer Matthew Meloy said in a conference call with analysts in January. They can be tough to negotiate because parties have to agree on what will trigger payouts, how big they will be and how long they will last. Sellers often want a say in how the buyer operates the target to assure they get paid, a concession nobody likes to make. Earnouts also can have potentially negative tax consequences for the buyer, said John Grand, a Vinson & Elkins LLP partner in Dallas who advises on energy deals. While earnout payments can be deducted as part of the overall purchase price, the extra revenue triggering them may be taxed as ordinary income at a much higher rate. They tend to be an option of last resort in negotiations for a company that failed to sell in an auction or had a deal with another buyer fall through, according to Grand. The buyout firm Quantum Energy Partners had a tentative agreement this year to sell Permian basin explorer ExL Petroleum Management to a Russian investment firm that fell apart because of regulatory concerns, people familiar with the matter said in June. Quantum then agreed to sell ExL to Carrizo Oil & Gas Inc. for $648 million plus as much as $125 million more in earnout payments, depending on future oil prices.